Chavis Enterprises, LLC is a provider of expert excavating work, lot clearing, hauling services and demolition services for Maryland customers in Harford County, Baltimore City, Baltimore County, Carroll County, Cecil County, Anne Arundel County, and Howard County, as well as York County in Pennsylvania. The company has a fleet of over 20 dump trucks equipped with the latest GPS technology to ensure the safest and most productive job. We haul almost everything. From aggregates and soil, wood chippings and stumps, to equipment and demolition debris, Chavis can haul it. We also haul water, whether you need freshwater onsite or want wastewater offsite. Contact us or call our office at 410-557-2455. 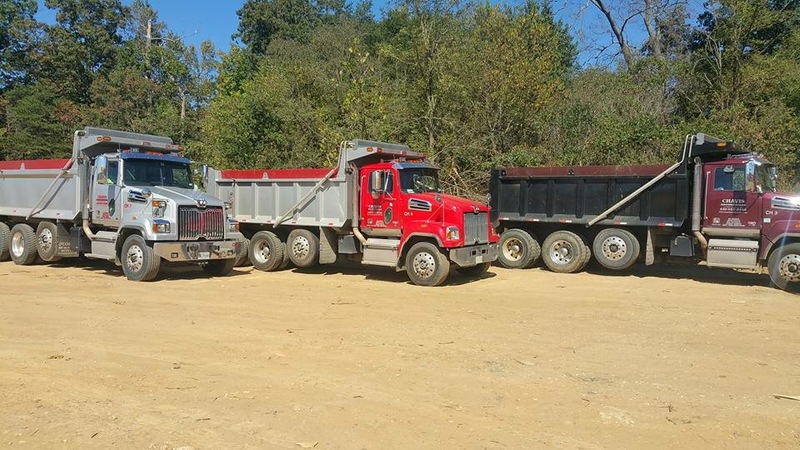 Chavis Enterprises provides dump trucks and demo trailer hauling services for all types of materials. Our quality hauling equipment and experienced operators suit the needs of construction companies, independent contractors, landscapers, and individuals. Chavis sets the standard for environmentally responsible removal and disposal with their prompt, professional, and courteous service. We hire only skilled and experienced truck drivers that are qualified for the job. Don’t just take it from us. Here’s a review. During the demolition process, I am extremely pleased to report that my confidence in Chavis Enterprises LLC was not misplaced. Contact us or call our office at 410-557-2455 .